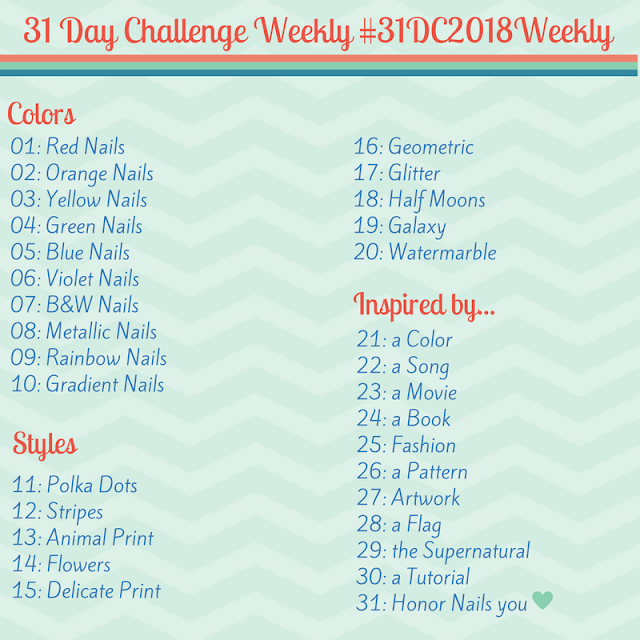 Quick Indie review: A'dor Beauty Supplies - Polish Etc. Hey y'all. I just have a really quick review for you this afternoon. I ordered from a new Etsy brand called A'dor Beauty Supplies that carried a bunch of mini nail polishes. The mini bottles retail for $3.50 and there are deals for 3, 4, or 5 bottles. 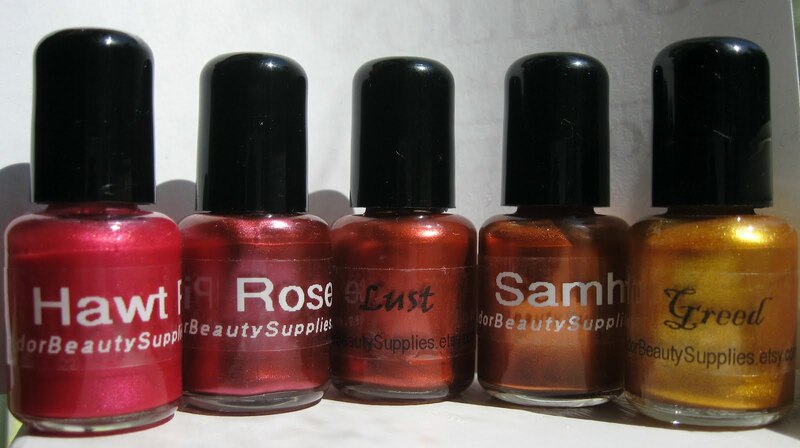 I bought 5 bottles and picked out some Hawt Pink, Greed, Lust, Samhain, and rose. She carries a lot of metallic-y shimmers and they all look so pretty! The swatches she supplies are very color accurate, but I swatched my 5 on one hand as soon as they came in the mail today (and while I'm talking about mail, let me tell you -- those bottles were packed to securely that it took me 10 minutes to get through all the layers of bubble wrap and padding!). 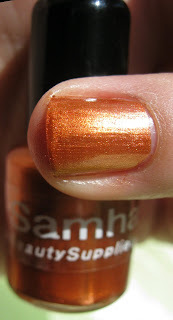 The formula was pretty nice, all of the colors covered in two coats except Samhain that only needed one coat. There were minor brushstrokes but the camera seems to exaggerate them, they weren't nearly as bad in real life. 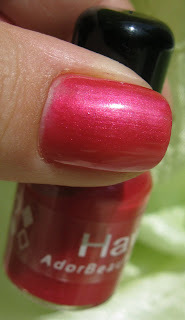 Hawt Pink is a great hot pink shimmer. 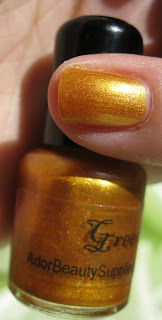 It reminds me a lot of OPI La Paz-itively hot. It is very shiny without top coat. 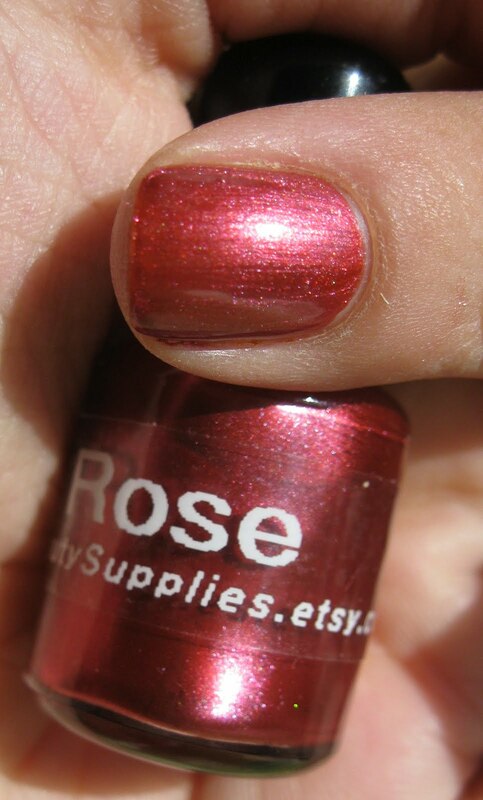 Rose is a pretty metallic mauve shimmer. It reminds me a lot of of OPI mauving to manitoba, but since I love that color, I'm in love with this one too! 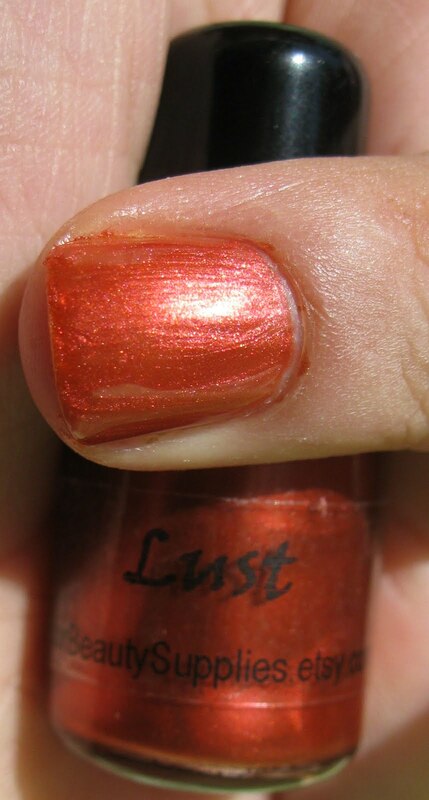 Lust is a pink-ish copper. Very pretty. Samhain is a true copper. Looks just like a shiny new penny. Lastly, Greed is yellow-gold. I don't usually wear gold but I like this one a lot. The colors I picked all look great together. 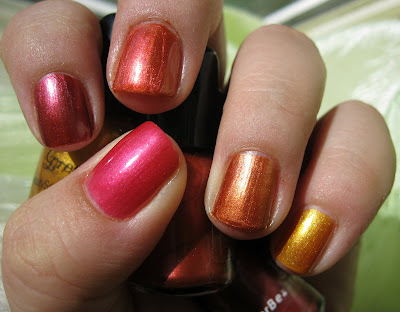 I could see wearing this as an ombre mani. I'll post more pictures when I wear these as a full mani. I'm especially ooh-ing over the Hawt Pink--what a great colour! 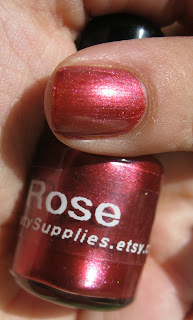 oooh #27 looks like a dupe for one of my etude polishes!